Last month, as the Sorcerer II - a 95-foot sloop belonging to genomics scientist Craig Venter - sailed west across the Indian Ocean, south through the Mozambique Channel, then on to Cape Town, every 200 miles or so its crew threw a hose over the side and pumped aboard 50 gallons of briny ocean. 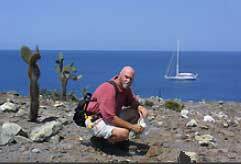 Craig Venter, in the Galapagos with his sloop the Sorcerer II in the background. In the last two years, the sloop has plied the world's oceans, searching for unknown microbes. The inflowing water was strained by an elaborate filtration system located on the ship's stern, and what resulted was the capture on filter paper of billions of microscopic organisms. Taken from the ocean's topmost tier, most of the single-celled species - whether bacteria, archaea, algae, protozoa, virus or lower fungi - have never been known about, the ocean's littlest creatures having largely been overlooked and underestimated until now. "It turned out that marine microbes were much smaller than those we usually encounter on land," noted Charles Kennel, director of UCSD's Scripps Institution of Oceanography and an adviser for the project. Virtually millions exist in every thimbleful of water. "So when we dragged filters through the water, these little tiny organisms slipped through the filters, and we didn't capture them." And on the rare occasions when they did, they couldn't keep them growing in a petri dish, not knowing enough about the chemical and nutritive conditions of their natural environment. All that is changing, however. Not only are scientists finding the means to fish out and identify these unicellular bits, their methods for culturing and studying them are rapidly improving. And the more proficient they get at this work, the more proof arises of just how important ocean microbes are to the planet. For that very reason, the sleek, white Sorcerer II set out from Nova Scotia in August 2003 to circumnavigate the globe and collect as many microbes as the crew could hose up. The expedition - which its Web site compares to Charles Darwin's chronicling of species from the H.M.S. Beagle - will arrive in the Caribbean this winter after wending its way around the tip of Florida, into the Gulf of Mexico, through the Panama Canal, on to the Galapagos Islands, across the South Pacific, past Australia's Great Barrier Reef and into the Indian Ocean. "It's important, because this is the first survey of its kind," noted Kennel. No other group has plunged after marine microbes in such a massive, unabashed way. "And it's important because Craig has shown that his technique will actually work and produce a complete genome." Once labeled and preserved, the microbe-saturated filters are airlifted back to the J. Craig Venter Institute in Rockville, Md., where they are cut into small pieces, a step in the process of "whole-genome shotgun sequencing." First applied by Venter in the '90s, this technique greatly quickens the chore of cracking the 4-chemical DNA code shared by all living things, whether itty-bitty picoplankton, cabbage or man. After sequencing the genes found in each piece, the scientists attempt to reassemble the sequences, jigsaw-puzzle-like, into a microbe's complete genome. Even if they don't succeed, at least they are finding and recording newly discovered genes, which gives them a handle on the related proteins. The microbes' inner proteins amount to the raw biology that supports not only Earth's food chain, but also the ocean's cycling of carbon, nitrogen, potassium, sulfur and other elements that are so vital to life on Earth. Venter, who earned both a B.A. in biochemistry and a Ph.D. in physiology and pharmacology from UCSD, has attracted considerable controversy over the years, both for his science and the fact that he's no shrinking violet. Controversy aside, few scientists have tunneled into biology's missing dimension of species' genetic codes so doggedly. And then, in a coup de main, Venter's company, Celera Genomics, began rapidly sequencing the human genome, prompting the federally funded Human Genome Project to speed up its work. In 2000, the two groups jointly announced the nearly completed reading of human DNA's roughly 30,000 genes. "Craig has been involved in lots of previous genome projects, and when he does something, he does it in a big way," said Edward DeLong, a microbiologist at the Massachusetts Institute of Technology. Venter indicated recently that his current pedal-to-metal pursuit of marine microbes is due to his love of the ocean, honed growing up in the Bay Area. "I've spent a lot of time on the ocean. I've been a swimmer, a surfer, a scuba diver, a sailor," he recounted. Hence his concern that every small misguided act, whether throwing trash in the ocean, or spilling oil, or driving a carbon-polluting car, can end up a global tragedy. "If we screw up the ocean, we screw up life on this planet," he said. The Sorcerer's voyage, funded in part by the U.S. Department of Energy and the Gordon and Betty Moore Foundation, can lead to a better understanding of how microbe communities function, Venter said, and "of the carbon cycle - how it breaks down carbon into oxygen," and more broadly, "of how life works on our planet," summed up Venter. "We've understood the chemistry of the ocean, the chemistry of the carbon cycle. We haven't understood the biology behind it, what drives it." It would be ideal to have a database of every ocean microbe's genome, said Venter. With this kind of information, scientists might grasp how microbes drive the ocean's fluxes of energy and matter and how to monitor these fluxes, thereby safeguarding the ocean's health. They might also gainaccess to an array of new proteins for foods, medicines and other useful products. Evidence for the crucial involvement of microbes in the ocean's cycling of elements keeps growing. A recent report in the journal Nature told of two species of archaea, a microbial group distinguished by its unique evolutionary heritage, that play a major role in the fixing of carbon and the cycling of nitrogen. "The domain archaea itself was only recognized several decades ago and thought to inhabit extreme and inhospitable environments. Now these microbes are known to be common in many habitats, including the ocean," said DeLong. Science reported in April 2004. Within these fragments were "over 1.2 million previously unknown genes." The pilot project's discovery instantly doubled the number of genes recorded in existing databases. As for what Sorcerer will net, it's projected that tens of millions more marine genes could be brought to light. So unknown is the world of microbes that fewer than 6,000 have been described. Of these, less than a dozen genomes have been entirely sequenced. In other words, modern microbe hunters such as Venter have a long way to go, since estimates range from 10 million to 100 million microbe species in sea, land and air - the latter being a place that Venter also is exploring. "We will identify airborne bacteria and viruses and sequence their genomes to better understand the diversity of life in the air we breath," he said last March. Many airborne microbes are thought to "elicit destructive immune responses in some patients, and we would like to explore these genes of interest in human health." The Air Genome Project currently is sampling the air over Rockville as well as the most densely populated region of the country - downtown Manhattan. Whether pulled from land, sea or air, the microbes that today's hunters are gathering hold many a secret in their proteins. For example, the Sargasso Sea study revealed 800 photoreceptor genes in marine microbes that are related to genes in the human eye's photoreceptor cells. The found genes' proteins convert light energy into biological energy, energy that helps the one-celled critters live. It would be as if humans depended primarily on the sun to fuel our bodies. This finding might explain why, as the pilot project uncovered, the upper regions of the Sargasso are surprisingly rich in microorganisms, when its waters are relatively nutrient-poor. It could be that in addition to energy from nutrients, most microbes in the ocean's surface also are thriving on energy from the sun. Venter looks to the day when researchers will be able to harness microbial proteins to make better solar products, pharmaceuticals, food additives, pollution cleansers and industrial agents. He and other oceanographers continue to view the sea as an untapped source of novel products that mimic nature-made fare. First, the Venter Institute and Scripps are building a database that will contain previously sequenced marine genomes, data from the Sorcerer voyage and oceanographic information such as climate patterns and ocean currents. "We want to get all of this information into one place," said Terry Gaasterland, director of the Scripps Genome Center, "so that scientists can ask questions like, how does my one-celled organism from this sea compare with another organism from another sea? What variations occur, and how are they distributed?" The database, nicknamed MARINA for Microbial Annotation Resource for Investigation and Analysis of genomes, will make it possible to compare whole stretches of genome. Finding differences in such stretches can mark a species' evolutionary trail, said Gaasterland. Of utmost value, MARINA is expected to eventually help monitor the health of the ocean by tracking changes in microbial communities. "You can think of microbes as canaries in the coal mine, if you will, because they have an extremely rapid response time. They can double in a day or less," explained DeLong. "If we can read those responses, and how they might influence cycles, then we'd have a very sensitive probe into how environmental changes are occurring."